by the other Martin Taylor (Image rights). 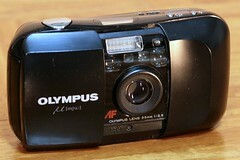 The Olympus µ[mju:] (US: ∞ Stylus) was a fully automatic 35mm compact camera introduced by Olympus in 1991. 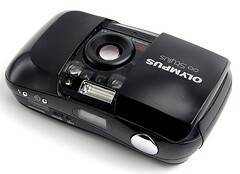 Notably evolved by camera designer Maitani Yoshihisa from his Olympus XA design. It was very small and curvy, with an integrated lens cover. It is switched on by shifting the lens cover to one side. The Stylus was the first model in the hugely successful Olympus mju/Stylus series, selling 5 million on its own. The original mju/Stylus was generally available in black, but a LIMITED edition model (50,000 examples) with a metallic silver finish was also released. 1992 saw the release of the Olympus µ[mju:] PANORAMA. This utilized tiny magnets to move a mask in front of the film in the middle of the roll, while keeping the body and basic spec unchanged. Some versions of the mju actually say µ[mju:]-1 on the front. Earlier Mju units were built in an Olympus factory in Japan, while some later examples (mostly 'µ[mju:]-1' marked), according to markings on the bottom, were assembled in China with Japanese-made parts. The technological specifications of this camera formed the basis of a retro-styled limited edition "concept" camera called the Ecru. ↑ Sales claimed by Olympus. Olympus mju, mju LIMITED and mju/Stylus PANORAMA in the official Olympus Global History.